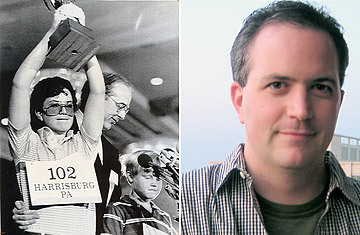 Though his own post-competition life was slightly rocky, Pennington warns off anyone looking for scandal in the lives of Spelling Bee winners. "There aren't any... living under bridges or cracking under the pressure. I haven't heard any horror stories, like the cast of Diff'rent Strokes or child stars gone bad. They seem to be average people. The only thing that tends not to be average about them is they tend to be smart and have very large memories and usually have more degrees than the average person." Nevertheless, it took Pennington nine years to get his postgraduate degrees at the University of California-Berkeley. During that period, he was diagnosed with bipolar disorder, which he believes may have prolonged his academic quest. "That was one thing I didn't even know about myself when I was in the National Spelling Bee," he says. "I'm generally quite open about it. It shows that many people with bipolar disorder are high functioning professional members of society. I do all the things I need to do to keep it in check. I keep healthy, take the right medicines and try to live right. I guess we all have our crosses to bear, everybody's got their 'something.'" A member of three national Quiz Bowl championship teams, he also spent his years at Berkeley running a website that kept close watch on political conservatives. Now, with his Ph. D in sociology, he's a federal contractor in Washington working for "a minor agency" in the Department of Defense. But, he says, "I'd prefer to be working as a statistical consultant to help the Democrats retake the White House." As a 14-year-old eighth grader, he was so blinded by the bright lights in the auditorium when he won, he borrowed his mother's sunglasses for post-competition photo sessions. He rushes to defend parents of spelling bee kids. "I know there's this idea they are stage mothers. That was not true in my case. I've found that it's generally not been true for most contestants. The amount of studying, memorization and love of the English language required in order to compete at the NSB is something that cannot be faked by a stage mother. It has to come from within the students themselves." The trophy has its own shelf in his mom's bookcase. It bears scuff marks from having been dismantled, inspected, and then reassembled by the Secret Service prior to the presentation by President Reagan who, for the record, did not drive Pennington into the left wing. Reagan was "a nice guy" and "affable," Pennington says.